Ashfall from Russia's Karymsky volcano is seen in a photograph taken Nov. 9 by an astronaut aboard the International Space Station. Fire and ice merge in a photo of ash rising from an eruption at Russia's Karymsky volcano, captured by an astronaut aboard the International Space Station. The photo was taken approximately an hour and 35 minutes after the snow-covered volcano erupted on Nov. 9 at 2:15 p.m. EST (22:15 UTC). The plume extends from the volcano's summit to the southeast, with brown ash deposits darkening the snow cover below the plume. Karymsky is one of more than 160 volcanoes on Russia's Kamchatka Peninsula. The steep-sided stratovolcano, built of alternating layers of lava, ash and rocks ejected in previous eruptions, towers 5,039 feet (1,536 meters) above sea level. Karymsky has spewed lava and ash nearly continuously since the late 18th century, and 114 volcanoes on Kamchatka have erupted in the past 12,000 years. 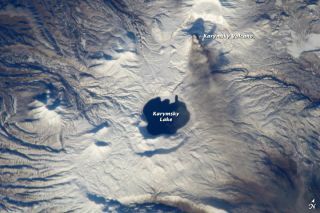 To the south of the ash plume is Karymsky Lake, which fills the Akademia Nauk caldera. A caldera forms during a massive explosion that empties and collapses a volcano's magma chamber, as with Yellowstone National Park and California's Mammoth Lakes in the United States. Akademia Nauk last erupted in 1996, NASA's Earth Observatory reported. Part of the Pacific Ring of Fire, the Kamchatka Peninsula is a volcanic arc with active volcanoes and frequent earthquakes. The source of the tectonic troubles is a subduction zone east of the peninsula, where the Pacific plate dives beneath the Okhotsk plate. This story was provided by OurAmazingPlanet, sister site of SPACE.com. Follow OurAmazingPlanet on Twitter @OAPlanet. We're also on Facebook and Google+.